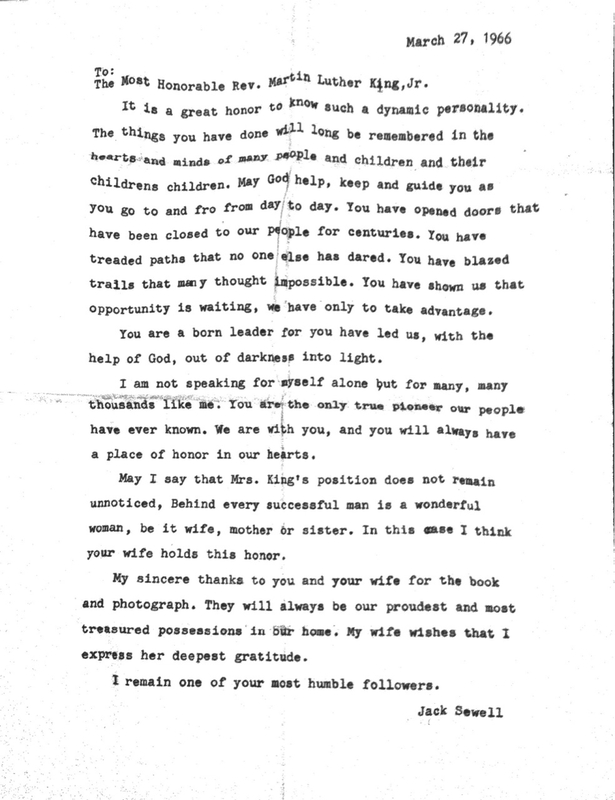 Letters from Coretta - who is nicka smith? An almost unbelievable story about Chicago, a corner store, and an autographed book and letters from two of the most iconic people in U.S. history. It was the year 1999. You would have thought we had won the Publisher’s Clearinghouse Sweepstakes, only it was paid in boxes. There were a bunch of them scattered about. Me, then a college student, and my parents, retirees, poured through each one, sifting out what we’d keep and what we’d throw away. It’s just the thing you do when you have a family member who has died. 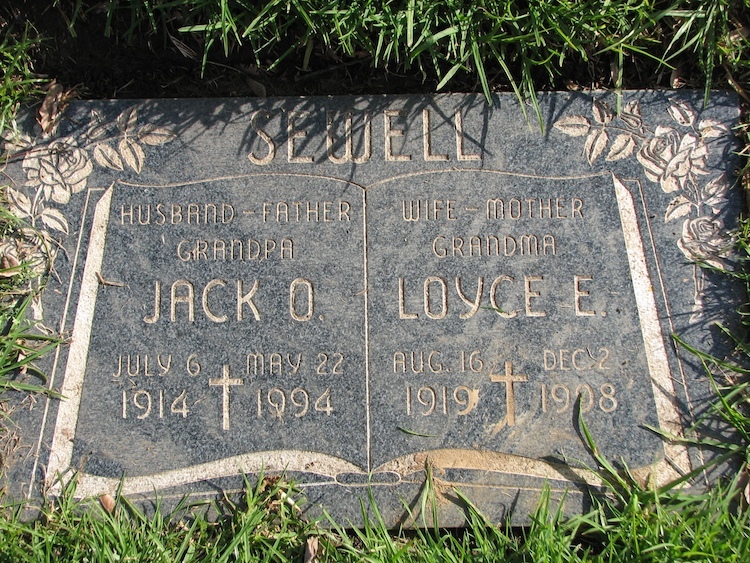 For us, there were boxes for three people who passed away within four years of each other – both of my paternal grandparents and my only paternal aunt. Most of the boxes were packed with newspaper from the year 1985 and hadn’t been opened for nearly 15 years. After the enduring the hurt of losing my only paternal first cousin Vance to a drunk driver, my grandparents packed up their house and moved to a smaller condo because it was too painful to live there with the memories they had of him. A smaller home equaled the reason for the unpacked boxes. Stemware, old dish towels, clothes. You name it, it was in there. Out of nowhere, I came across a yellowed envelope addressed to my grandfather care of their corner store, Gail’s Certified Market. The store was located at 3748 W 16th Street, Chicago, IL and was named after my paternal aunt. Wait, what. What in THE world?!? 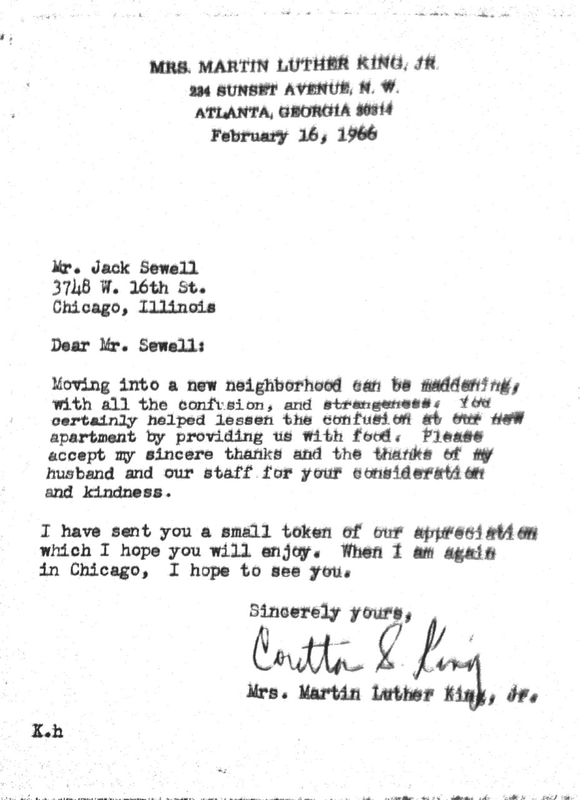 A copy of the February 16, 1966 letter written to my grandfather, Oswald (Jack Oscar) Sewell by Coretta Scott King. My first instinct was to question it. My grandparents never lived in Atlanta and Dr. King and his family never lived in Chicago…at least I thought they didn’t. 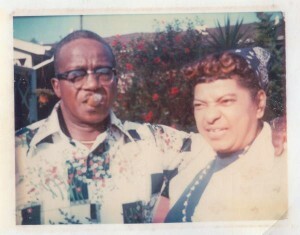 I knew that nearly a year after the Watts Riots my grandparents moved from Chicago to Los Angeles, but I knew for sure they never lived in Atlanta. Moving into a new neighborhood can be maddening, with all the confusion, and strangeness. You certainly helped lessen the confusion at our new apartment by providing us with food. Please accept my sincere thanks and the thanks of my husband and our staff for your consideration and kindness. I have sent you a small token of our appreciation which I hope you will enjoy. When I am again in Chicago, I hope to see you. …I came to Chicago, I brought this…fully intending to deliver it to you [as] an expression of our appreciation…you may have seen in the papers, we…involved in cleaning up the apartment, house…taking care of all the other business, ne[ver] got to see you. Since this sort…[in]volvement may happen the next time I…thought it would probably be quicker…to you. Next, was the gift. 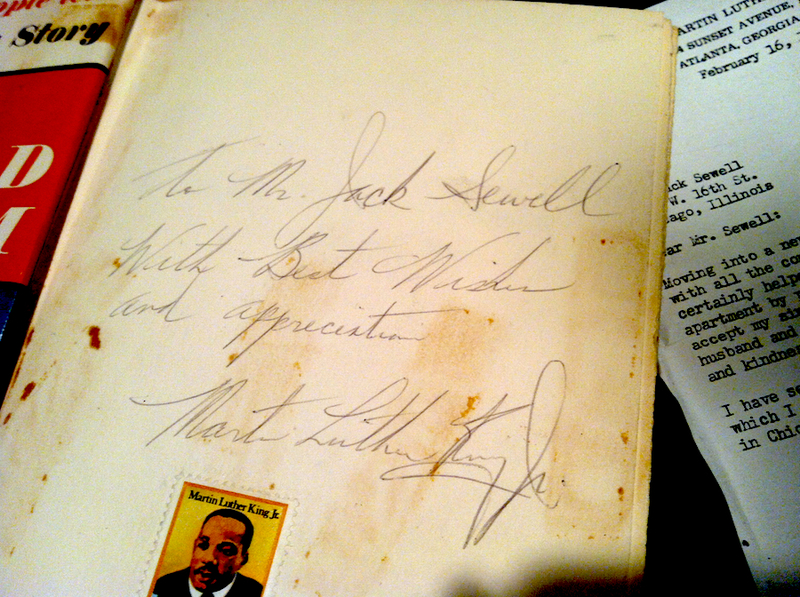 It was a copy of Dr. King’s book, Stride Toward Freedom: The Montgomery Story (published November 30, 1957, this copy was printed in 1958), and it was autographed. Later, I would discover that this book detailed Dr. King’s experiences during the Montgomery Bus Boycott from 1955-1956 and it was the first book he had written!!! My grandfather was an avid stamp collector. 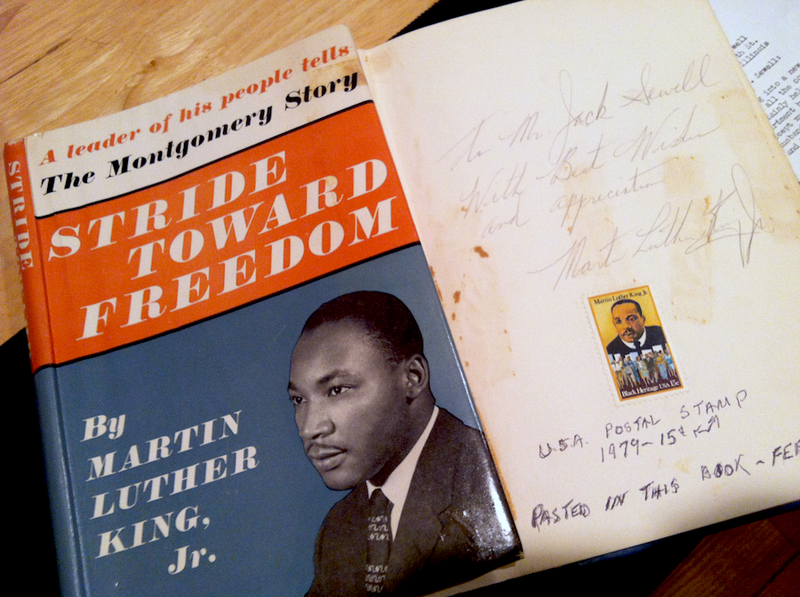 When the US Post Office released it’s first ever MLK stamp, he purchased one and adhered it to the page with the autograph. He also wrote the date he pasted it in there. It was less than a month before I was born. At this point, my entire face was on the floor. How in the world was this packed in a box in the garage at our house and I had NO idea?!? I looked to my dad who told me he remembered his father mentioning something about this and that Dr. King did live in Chicago at one point. That’s when the researcher in me headed to out to get more information. 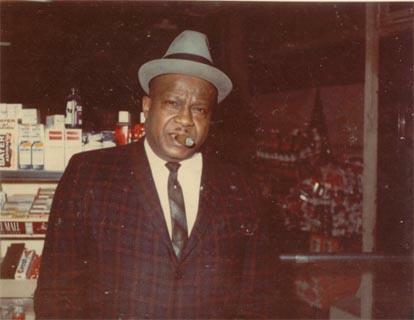 Oswald (Jack Oscar) Sewell standing inside of Gail’s Certified Market. It was located on the west side of Chicago. Based upon information in the Encyclopedia of Chicago, Dr. King moved his family in January 1966 (2). This lead me to believe that my grandfather delivered groceries to them around that time especially since the first letter from Mrs. King was dated February 16 of the same year. My grandfather provided food for one of the most important people in U.S. history. Wow. Mass marches ensued. Dr. King eventually got hit in the head with a rock while demonstrating in an all-white neighborhood on August 5, 1966. Eventually, Mayor Richard Daley and the campaign leaders, which included Dr. James Bevel and Rev. Jesse Jackson, settled on terms for ending the campaign at the end of the same month. (3) The campaign is widely considered to have lead to the creation and passage of the Civil Rights Act of 1968, also known as the Fair Housing Act of 1968. Years later, as I sit here typing this, it is still unbelievable to me that my family had a tie to something so significant. I pondered the reasons why my grandfather did what he did. Luckily, he kept copies of the letters he sent back to the Kings. The words he wrote rung true for the time he wrote them and they resonate even more now that we’ve recently celebrated the 50th anniversary of the March at Selma. 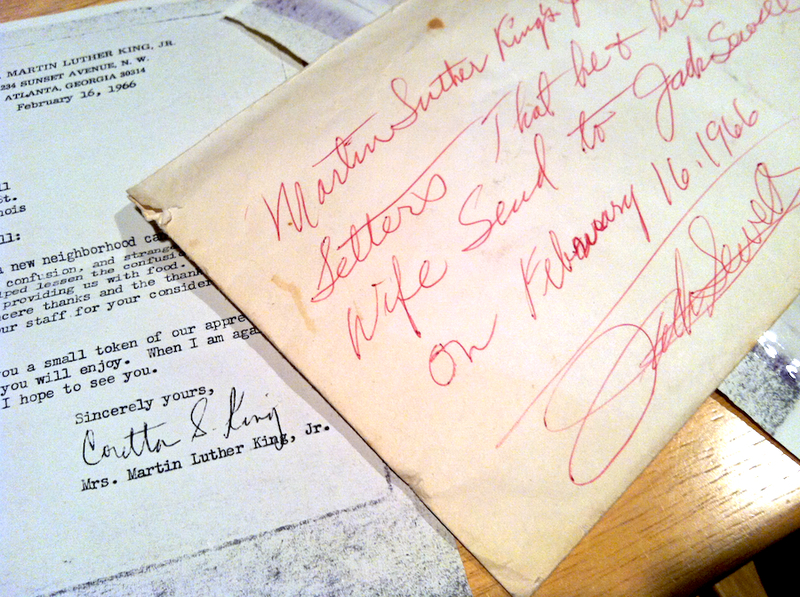 Copy of the March 27, 1966 letter written by my grandfather, Jack Oscar Sewell to Rev. Dr. Martin Luther King, Jr. and his wife Coretta Scott King. The Most Honorable Rev. Martin Luther King, Jr. It is a great honor to know such a dynamic personality. The things you have done will long be remembered in the hearts and minds of many people and children and their childrens children. May God help, keep and guide you as you go to and fro from day to day. You have opened doors that have been closed to our people for centuries. You have treaded paths that no one else has dared. You have blazed trails that many thought impossible. You have shown us that opportunity is waiting, we have only to take advantage. You are a born leader for you have lead us, with the help of God, out of darkness into light. I am not speaking for myself alone but for many, many thousands like me. You are the only true pioneer our people have ever known. We are with you, and you will always have a place of honor in our hearts. May I say that Mrs. King’s position does not remain unnoticed, Behind ever successful man is a wonderful woman, be it wife, mother or sister. In this case I think your wife holds this honor. My sincere thanks to you and your wife for the book and photograph. They will always be our proudest and most treasured possessions in our home. My wife wishes that I express her deepest gratitude. I remain one of your most humble followers. (1) “Chicago Campaign (1966).” Chicago Campaign (1966). Stanford University Martin Luther King, Jr. and the Global Freedom Struggle Website, n.d. Web. 09 Mar. 2015. <http://mlk-kpp01.stanford.edu/index.php/encyclopedia/encyclopedia/enc_chicago_campaign/>. (2) “Martin Luther King, Jr., in Chicago.” Martin Luther King, Jr., in Chicago. Chicago Historical Society, 2005. Web. 09 Mar. 2015 <http://www.encyclopedia.chicagohistory.org/pages/1438.html>. (3) “Chicago Campaign (1966).” Chicago Campaign (1966). Stanford University Martin Luther King, Jr. and the Global Freedom Struggle Website, n.d. Web. 09 Mar. 2015. <http://mlk-kpp01.stanford.edu/index.php/encyclopedia/encyclopedia/enc_chicago_campaign/>. What a great find! This post was a pleasure to read. I love that your family has a tie to movement and that they contributed in the best way they could. Oh and your grandfather was right behind every successful man is a wonderful woman.